The night before prepare chia pudding and oats: place chia seeds in a jar and cover with about 100 ml of milk of choice (plant-based or dairy). Add a bit of salt, stir well, cover with a lid and refrigerate overnight. Do the same with oats - put oats in a jar, cover with about 100 ml of milk of choice, stir, cover with a lid and refrigerate overnight. In the morning, blend the oats shortly with a stick blender. Place berries in a pan, add 1 ts of brown sugar and heat on medium. Cook for about 10 minutes, stirring regularly, until the berries reduce to a thick sauce. Remove from heat and set aside to cool. Assemble your pudding. 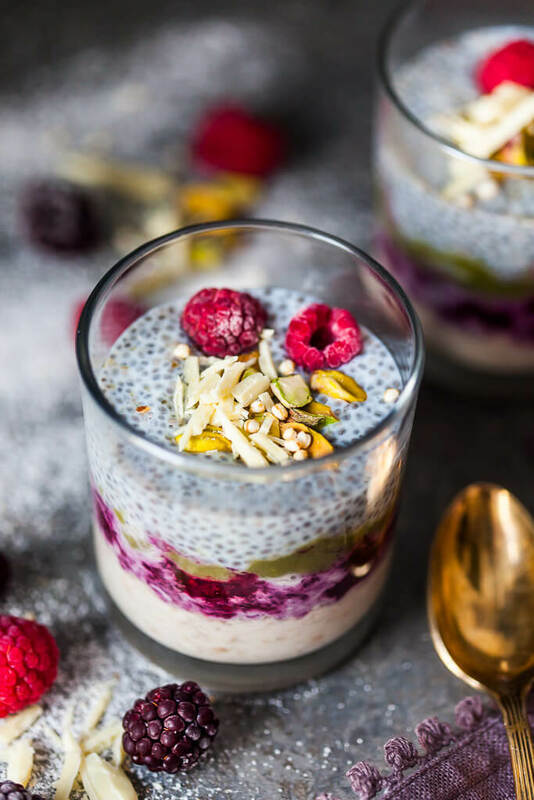 Put blended oats on the bottom of a jar or glass, add a layer of berry sauce, add a teaspoon of pistachio cream and top with a layer of chia seed pudding. Decorate with a few berries, chopped pistachio nuts and white chocolate. Serve.